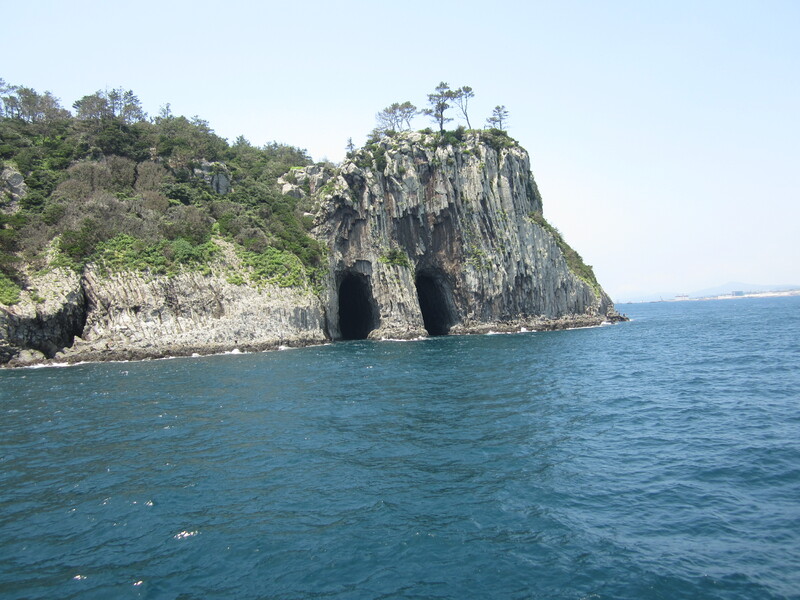 Having read through the previous post I decided to do a separate entry about this wonderful island,especially for our friend Anne Hilty who has devoted several years to this place.IT is not very well known outside of Korea and I am not sure why. We spent a few days on the island travelling around and were lucky to have blue skies and pleasant temperatures,and we found it to be a very special and beautiful place. So here goes. 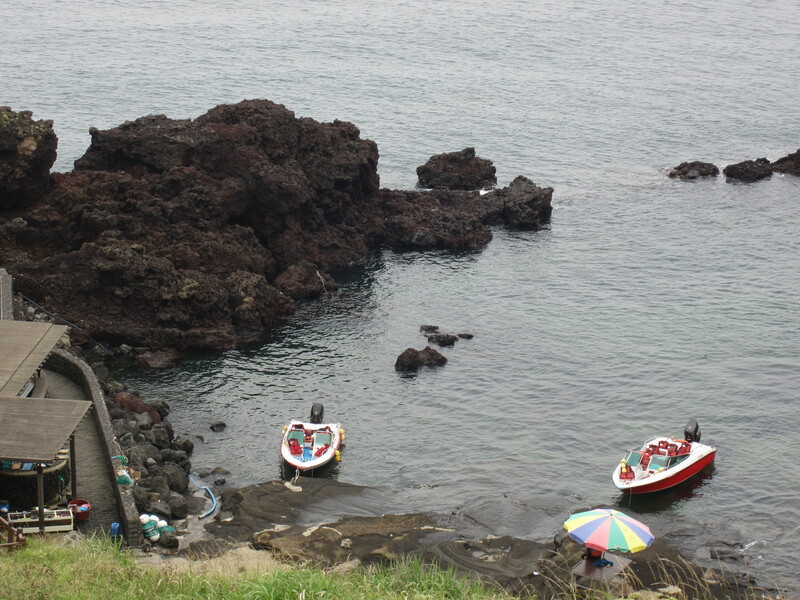 We arrived by plane from Seoul,having ascertained that the ferry was not cheaper and definitely not more comfortable.So we flew into Jeju city,the main city in the north of the island. We were intending to drive a hire car around but the companies had no cars,and anyway didn’t recognize our Israeli licence and we had no International licence.So we hired a driver for one day to see some of the sights and then discovered the wonderful airport limousine bus which tours the ringroad around the island and visits many of the main sights.So the first day our driver took us to several major sights,waited for us in the car or accompanied us and took photos,and even lent us raincoats for the Manjanggul Lava tube caves which we had not realized would be freezing cold and dripping wet! From the lava tube we drove to Sunrise Peak,Seongsan a beautiful cliff dropping down in the sea,which gives wonderful views of the island once you have staggered your way to the top.We didn’t do it at sunrise but I believe that’s what you are supposed to do.Anyway the view was certainly impressive and we ran into tons of Chinese tourists on the way up (as we did pretty much everywhere in Korea) and greeted them with Ni Hao! Zai na li, much to their surprise. 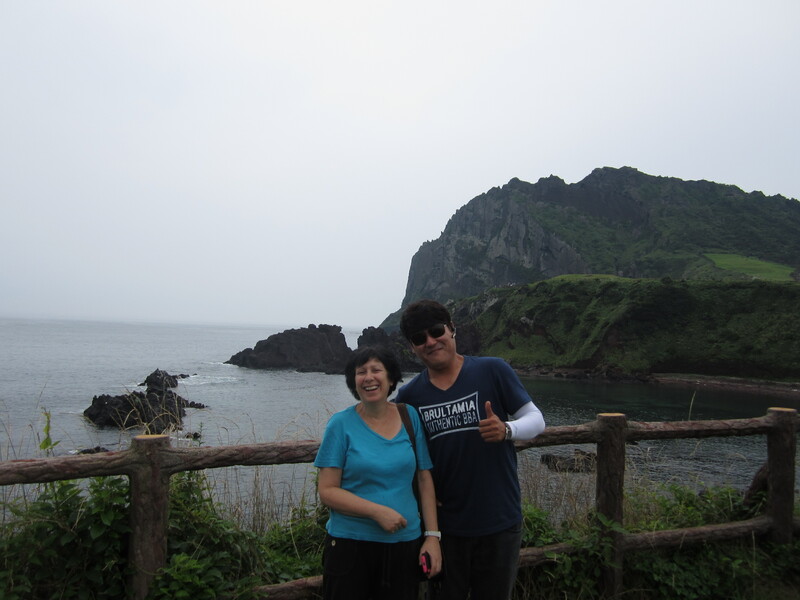 We then went to a beautiful bit of the coastline where apparently some very popular Korean TV show is filmed but of course we had never heard of it.The view was great so we didn’t care.Lots of Koreans and Chinese taking their photos in front of the lovely scenery. Next we visited a boring folk village which was an excuse to try and sell us some stupid juice made out of some berries or something which we refused to do at which point they told us they had to close for the day (!) 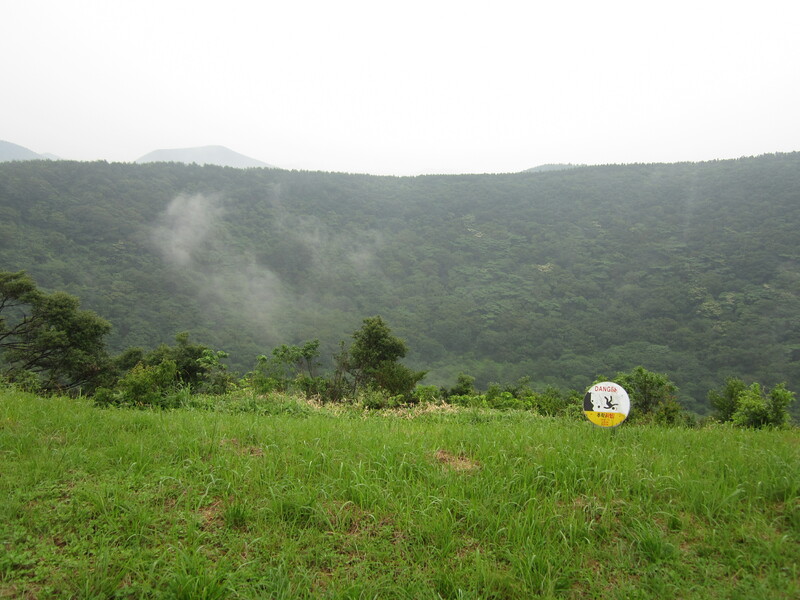 and even though it was raining a little Mr Kim took us to one more place which I think was called Sangumburi a sort of misty crater rather wet but very beautiful and atmospheric. 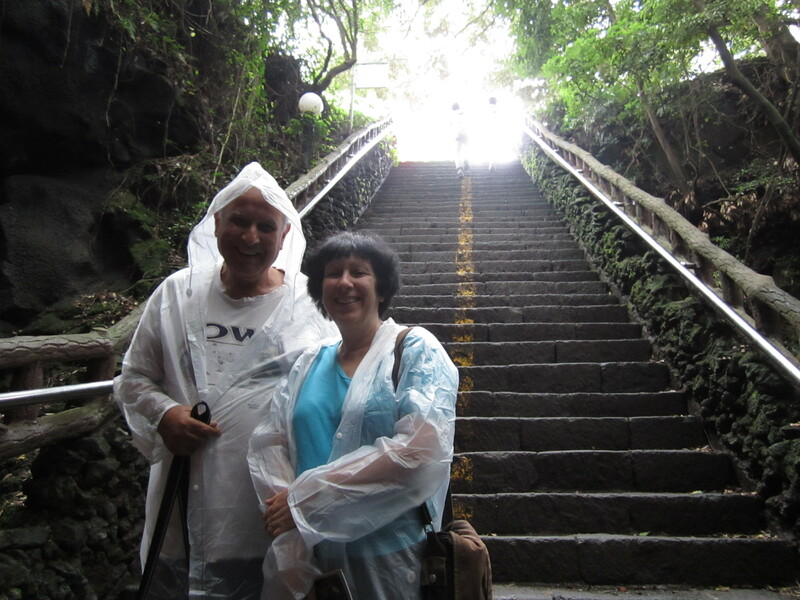 Next day we had lunch with Dr Anne Hilty a friend of a friend,who has helped write a book about Jeju island. She very kindly picked us up from our hotel and drove us to a restaurant where she introduced us to some delicious local specialities,and gave us a signed copy of her book on Jeju.Then she deposited us at the bus stop so we could go down to Seogwipo the city on the south side of the island where we THOUGHT we were staying.It turned out that the hotel I had booked was in fact another 180 minutes by bus from Seogwipo city.Nevertheless we arrived there eventually and found the guesthouse to be awesome and beautiful but in the middle of nowhere,right near Sunrise Peak the place we had visited the day before. The lady at the guesthouse kindly allowed us to cancel the second night when we explained we actually wanted to stay in Seogwipo city (the two hotels had the same name you see) and then took us by car to a nearby restaurant for supper and told the owner of the restaurant to drive us home when we were done! So charming. From the hotel in Seogwipo city we discovered the airport limousine bus which travels around the island stopping at strategic points along the way. 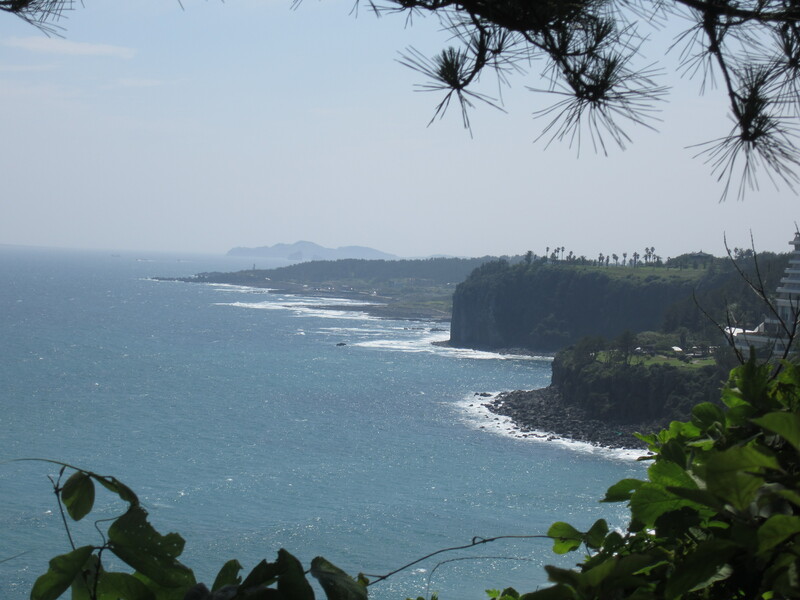 We took it to the beach near the Lotte Hotel complex where we enjoyed the views of the coast and relaxed a bit.Next day we took a cruise along the beautiful south coastline and reflected on how lucky we were to be in such a gorgeous place. 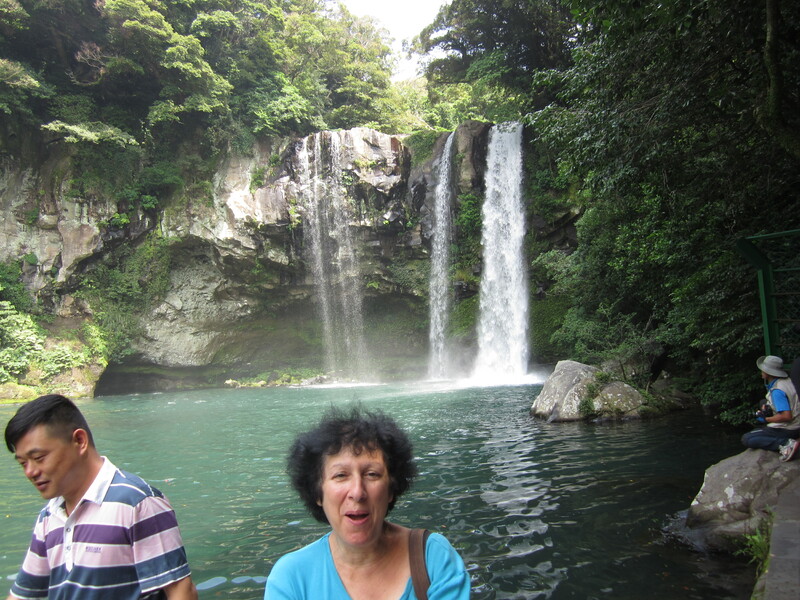 We also walked to Cheongjiyeon Waterfall only 15 minutes from our hotel in Seogwipo city (yet more Chinese tourists ni hao ni hao) and went back to the beach again one last time before flying next day to Busan…. but that’s another story.